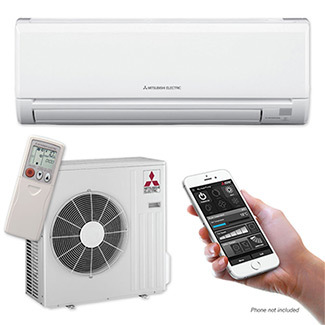 Ductless Mini-Split Heat Pumps are similar to conventional heat pumps but make use of a number of smaller indoor units instead of a single large one. In heat pump systems of this kind, an outdoor unit feeds anywhere from two to eight separate indoor units, each of which heats or cools one or two rooms. The outdoor unit is connected to the small indoor units through a relatively small conduit, and each indoor unit delivers conditioned air directly into the room it is stationed in, instead of circulating air through ductwork. Our ductless heat pump rentals provide flexible and affordable heating and cooling solutions for homes, businesses and other spaces without ductwork. See here for full details about our rent to own program. No Need to Install Ductwork – For homes that lack existing ductwork, the fact that systems of this sort do not rely on it can make a big difference in terms of initial investment and ease of installation. For homes equipped with radiant or hydronic heating systems, for example, installing a ductless system can be much cheaper than a conventional furnace or heat pump that would require the addition of ductwork would be. Since ductwork and ordinary furnaces also take up room within a home, systems of this kind can help maximize living space, as well. Energy Efficiency – Because each indoor unit blows air of an appropriate temperature directly into a living space, there is no loss of energy efficiency to ductwork. This can improve the overall efficiency of the system by as much as 35% compared to conventional air-sourced heat pumps that use ductwork. Targeted Heating and Cooling – Having a number of separate indoor units, each with its own thermostat, allows for fine-grained control of heating and air conditioning across rooms. This can further lower energy bills, as homeowners can focus on establishing comfortable temperatures in the parts of their homes that are actively inhabited. It can also allow residents to precisely tailor conditions in particular rooms to their personal preferences. 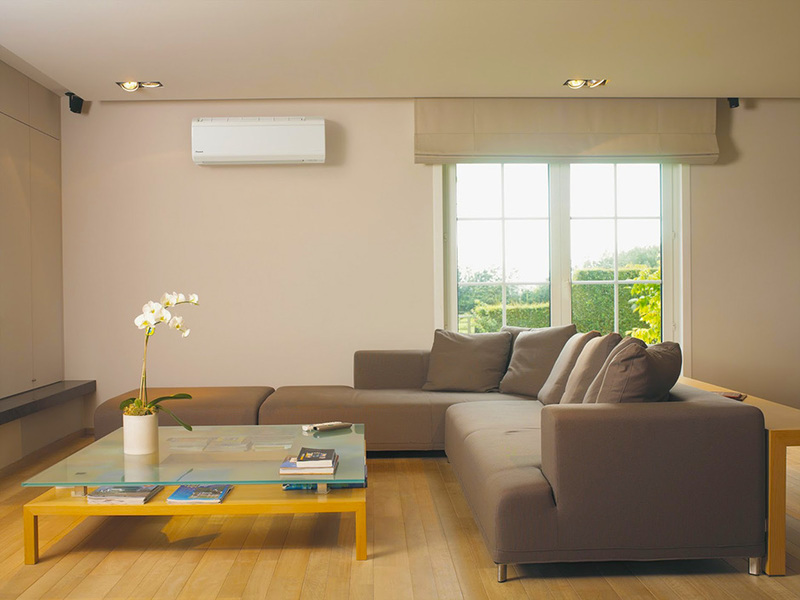 Relatively Unobtrusive – As the name suggests, the indoor units of Ductless Mini-Split Heat Pumps are fairly small. The flexibility of their connection to the main, outdoor unit also means that they can normally be mounted in a variety of places, making it relatively easy to conceal them or work them smoothly into existing interior designs. Compared to window-mounted air conditioners, then, systems of this kind can be much less visually and physically obtrusive. More Secure – In terms of the effect on a home’s security, installing such a system typically only involves creating relatively small holes in outer walls for the conduit to pass through. Compared to window-mounted air conditioners or those that are inset in walls, systems of this kind generally have much less of an impact on a building’s overall security. Units Must Be Sized Appropriately – Selecting a system of an appropriate capacity is important for efficiency both in terms of initial investment and ongoing energy use. A system that is too large for a given home will cost more than necessary from the beginning and will cycle in short, inefficient bursts once in use, leading to higher energy bills. Systems that lack sufficient capacity will not be able to provide the desired level of comfort. Indoor Units Will be Visible – Although they are relatively small and can generally be installed in out-of-the-way locations, the indoor units of these systems will often be visible in everyday use. Some homeowners will find this objectionable enough that they will prefer ducted systems for this reason. Qualified, Experienced Installers – Because split, ductless air conditioners are less common in practice than other kinds, it is especially important that homeowners ensure that whomever they contract to install them have experience with such systems. While they are not fundamentally more difficult to install than heat pumps and air conditioners of other sorts, correct installation and placement of indoor units requires experience that not all technicians will have. Thankfully at Furnace Rental our certified technicians are qualified and well-experienced in dealing with ductless mini-split systems, and as with all our rentals, your satisfaction is fully guaranteed! ENERGY STAR Certification – As with other kinds of heat pumps, the ENERGY STAR symbol designates those models that have been tested to be among the most efficient available. An EnerGuide label can help put the performance of a particular model into context, as well. 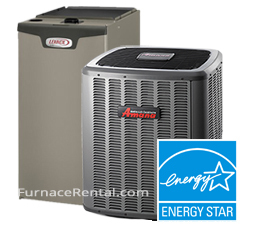 Our systems are Energy Star certified. Give us a call toll-free at 1-877-785-1055 for more information or if you have any questions, or to get started with a free 2-minute quote.